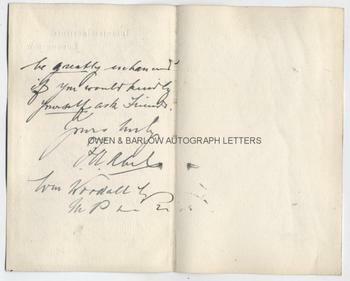 SIR FREDERICK ABEL autograph Letter Signed. British (English) chemist. The inventor of Cordite. ALS. 2pp and integral blank leaf. 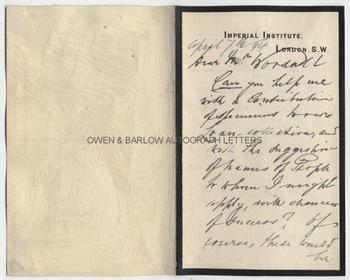 Imperial Institute, London, S.W. April 7th 1894. To William Woodall. Together with a fine contemporary portrait photograph. "Can you help me with a contribution of ...[?] to our Loan-Collection, and with the suggestion of names of people to whom I might apply, with chances of success? Of course, these would be greatly enhanced if you would kindly yourself ask friends". 8vo. Approx 7 x 4.5 inches. Mounting traces to verso of integral blank leaf, else fine. 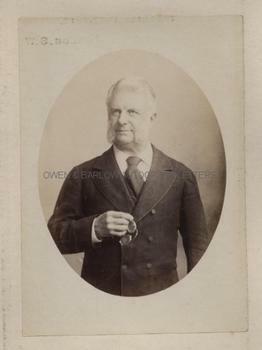 The portrait of Frederick Abel is a fine 19th century gelatin silver print photograph measuring approx 5.75 x 4 inches. It shows Sir Frederick half-length in oval vignette. 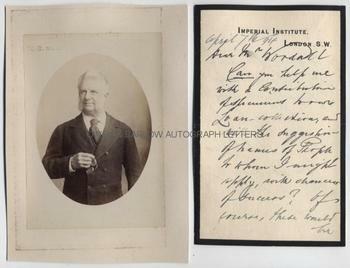 The photograph is laid down on silk backed card from album leaf and is in fine condition. Sir Frederick Augustus Abel succeeded MICHAEL FARADAY as chemist to the Royal Military Academy at Woolwich. From 1854 to 1888 he was ordnance chemist, carrying out extensive research and experiments with explosives and he was also appointed chemist to the War Department. Amongst his many discoveries and inventions were guncotton and the explosive, Cordite. He also carried out work developing electrical fuses. He was a Fellow of the Royal Society and President of the Institution of Electrical Engineers. He was the first director of the Imperial Institute. Sir Frederick Abel would have come into close contact with William Woodall during Woodall's time as Surveyor-General of the Ordnance and later as Financial Secretary to the War Department, a post held by Woodall under both Gladstone and Lord ROSEBERY.